In the US in 2038, a secret society is imposing its agenda on outspoken Christian leaders, killing when necessary. Corporate regulations restrict religious expressions and policies. A recent convert, Hutchence, uses creative and guerilla-like techniques to spread the Gospel of Jesus. This enigmatic man enlists a rag-tag group of individuals to help him proclaim a warning to the rest of the country: God is sending his judgment on our nation, and his first act will be to destroy Chicago. One recruit is a young and talented computer analyst who specializes in mastering algorithms for corporate and political use, and who is on the run from the company she works for, while trying to discover the truth about her father's mysterious disappearance. Another is a conspiracy-theory-junkie & survivalist who has discovered proof of assault on people of the Christian faith. And a widower with three girls is recruited by this mysterious Hutchence to help lead a return to God in America. 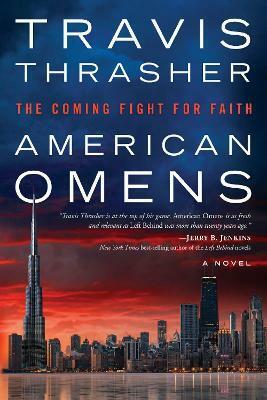 "In American Omens, Travis Thrasher is at the top of his game, imagining the future with the eyes of a seasoned novelist penning the story he was destined to write. As fresh and relevant as Left Behind was more than twenty years ago, American Omens may be the first of many more novels about the persecuted church from this writer. We can only hope so." --Jerry B. Jenkins, New York Times best-selling author of the Left Behind novels "Thrasher's outdone himself with this multilayered story of ultimate stakes. Written with deft and obvious passion, American Omens is a thrilling, eerie sci-fi that feels far closer to reality than fiction." "American Omens is, simply put, stunning. Stunning in the delivery of story that grabs you from the first paragraph. Take caution: it will root you where you stand until you finish the first chapter. Then you'll be reluctant to wait longer to start on the rest. And it's stunning in the quality of prose--vivid images and great dialogue. Travis Thrasher has written a novel that will take you on a roller coaster to unexpected places. When you finish, aside from wishing there was more, you'll have a disturbing sense of where the future is headed." Travis Thrasher is the author of?more than a dozen?works of fiction including two novellas, "The Promise Remains "and "The Watermark". He has been called ?the Nicholas Sparks of Christian fiction? by "Christian Retailing "magazine. Travis's drive and imagination have allowed him to see a variety of books published: from love stories ("The Watermark; Three Roads Home) "to suspense ("Gun Lake; Admission; Blinded") to drama ("The Second Thief; Sky Blue") to supernatural thrillers ("Isolation; Ghostwriter"). Travis lives with his wife and daughters in a suburb of Chicago.